Hero Xtreme, the name rings a bell but doesn’t wake up someone in deep slumber. 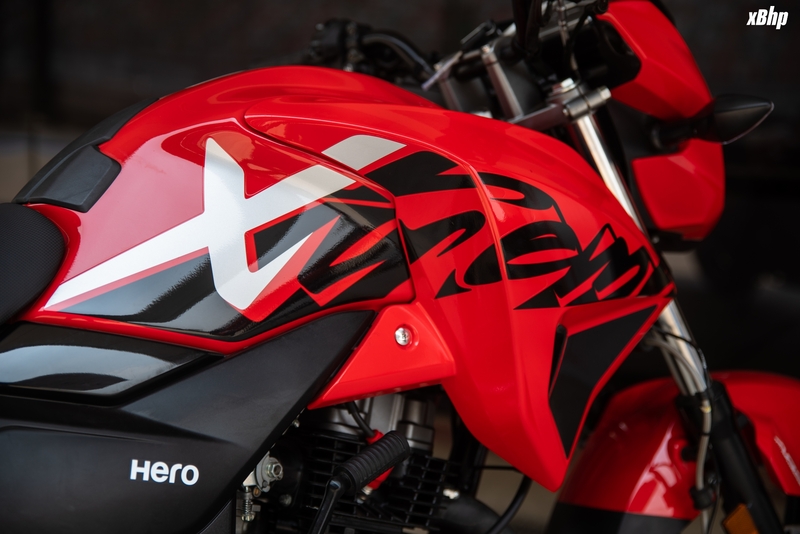 Hero Xtreme 200R, this bears a lot of weight with the ‘R’ tag and does stir things up. Things like the Indian power-commuter market. The name does ruffle the feathers of some other contenders like the RTR 200 4V, Pulsar 200 NS, FZ 25 etc. But all those things are being done by the name. Can the actual motorcycle pull off something similar and do justice to a very intriguing name? 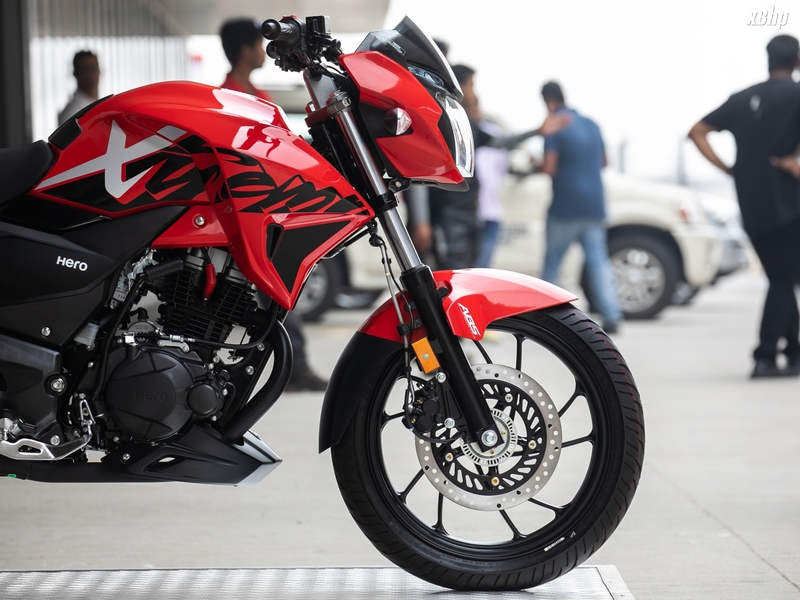 We find out as we ride the Xtreme 200R on BIC. 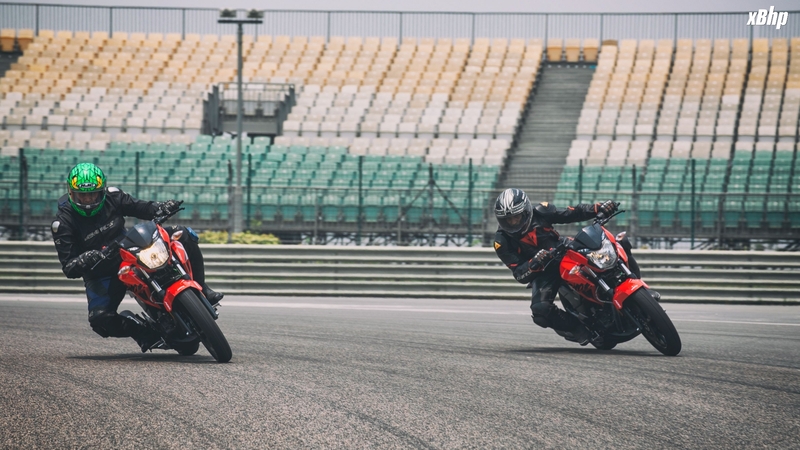 One look at the Xtreme 200R reminds you of its younger sibling, the Xtreme Sports. The bikes are different not only in displacement, but a lot of other things, yet the design is clearly based on the smaller Xtreme. 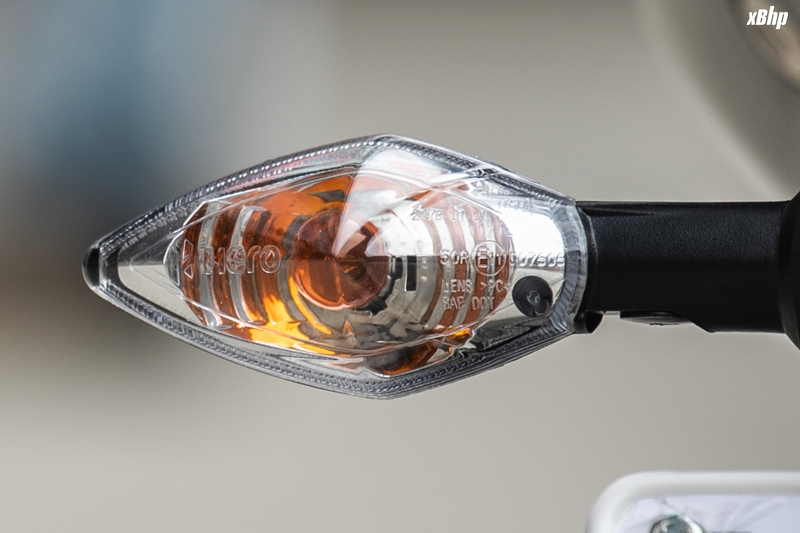 The front fascia is home to the ‘wolf eyed’ LED pilot lamps that do enhance the visual presence of the motorcycle. 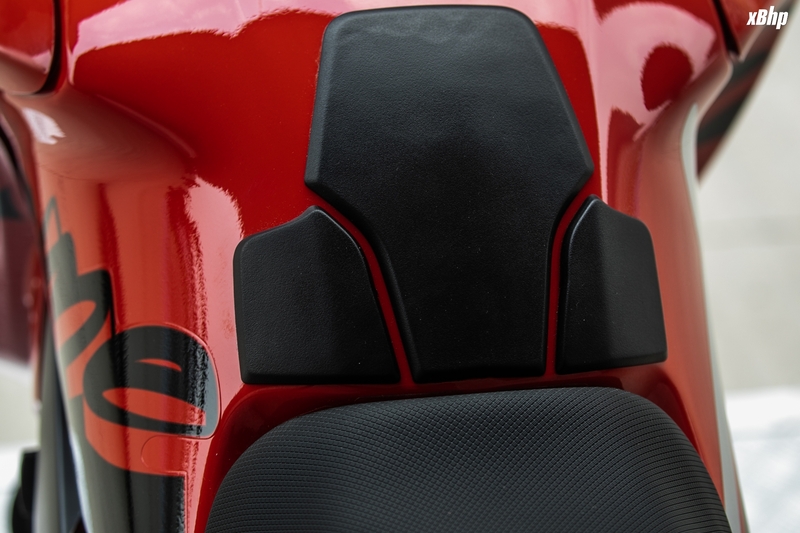 The tank shrouds are integrated very well and the graffiti-like graphics on the tank shroud only add to the appeal of the side profile of the motorcycle. The side panels are minimalistic and bear the Hero badging. 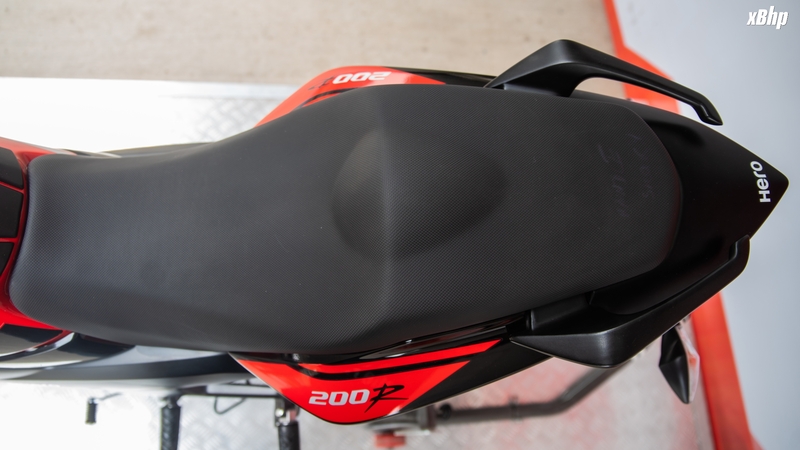 The rear cowl has also been sharpened and are home to the 200R branding. 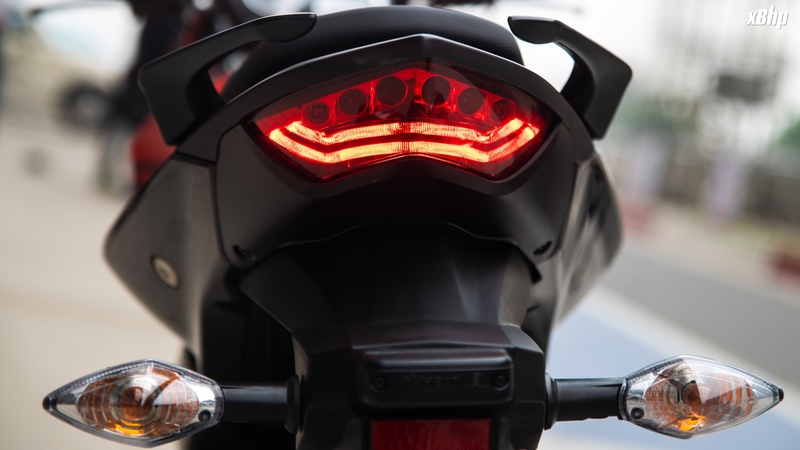 The bullhorn shaped grab-rails and the LED taillight constitute the rear of the motorcycle. 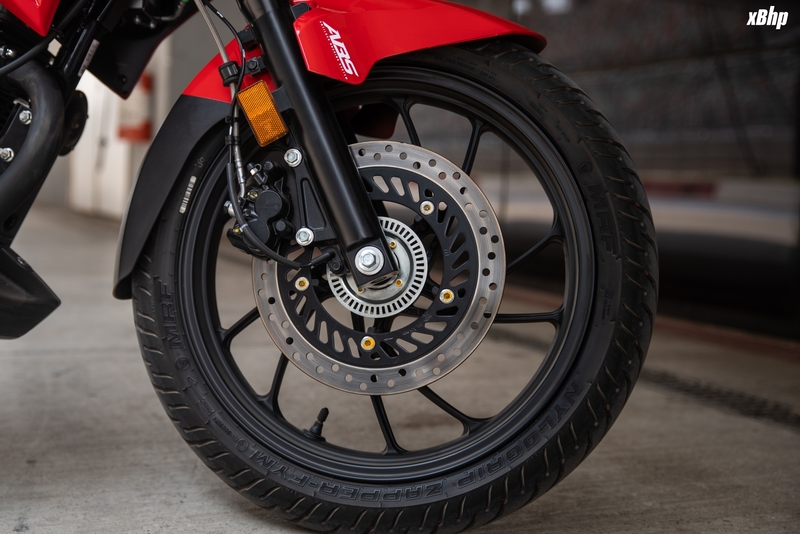 The 130mm wide rear tyre adds to the sporty intent of the motorcycle. 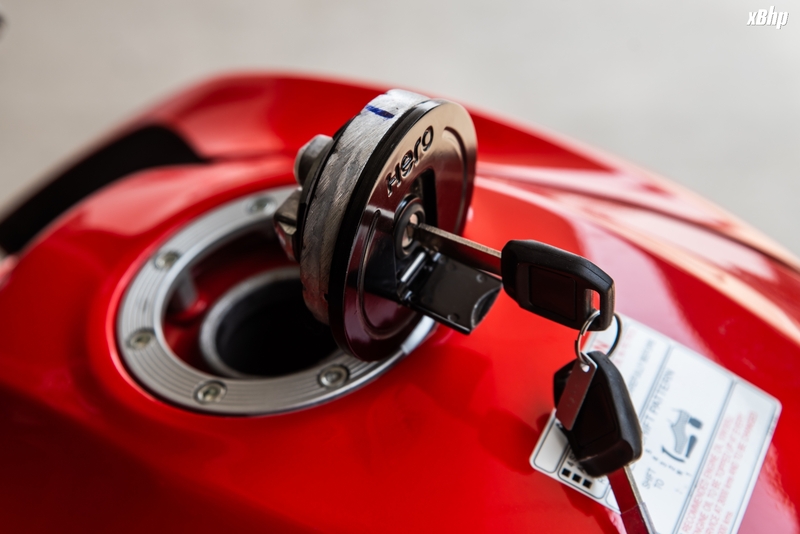 The bike features an air cooled, 4 stroke, 2 valve, 199.6cc single cylinder engine. It produces a maximum power of 18.1 bhp at 8000 rpm and a maximum torque of 17.1 Nm at 6500 rpm. 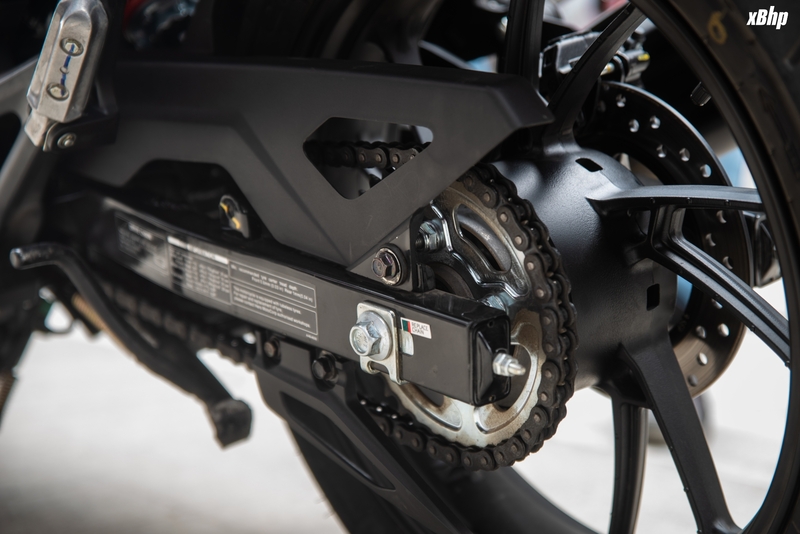 The power is transmitted to the rear wheel via a 5-speed transmission. The new bike gets disc brakes on both wheels and an optional single channel ABS. 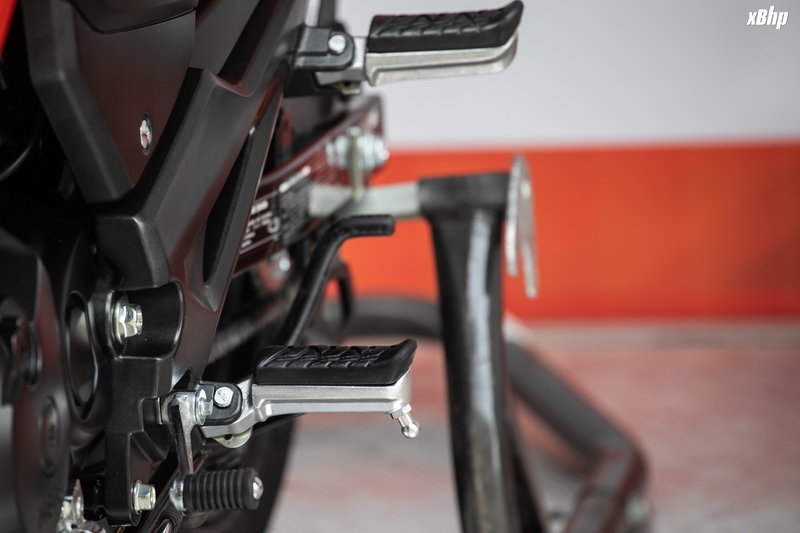 The front suspension is a 37mm conventional telescopic fork and the rear is an adjustable monoshock unit. The chassis is diamond type and the bike carries a wheelbase of 1338 mm. 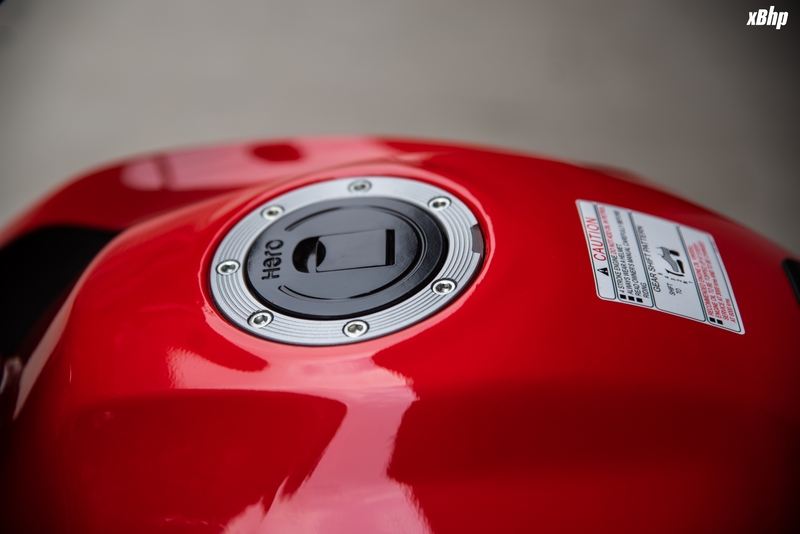 The bike gets a 12.5 litre fuel tank. 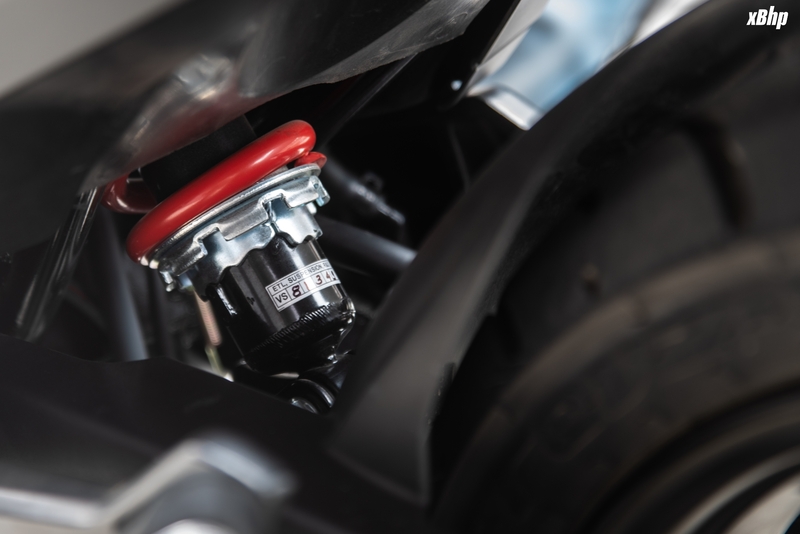 Xtreme 200R tips the scale at 147 kg with an increment of 1 kg for the ABS equipped unit. 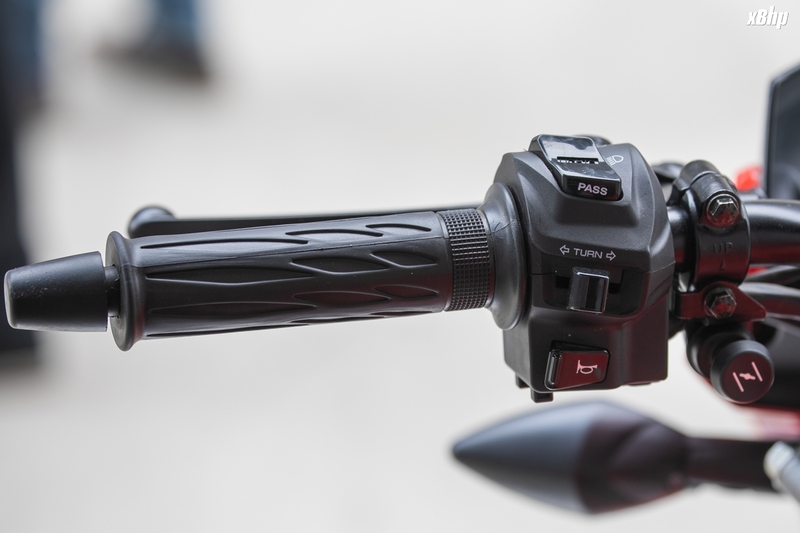 The console is similar to the smaller Xtreme with an analogue tachometer and a digital speedometer. The screen is blue backlit. The digital unit also houses a trip meter, an odometer and a digital fuel gauge. 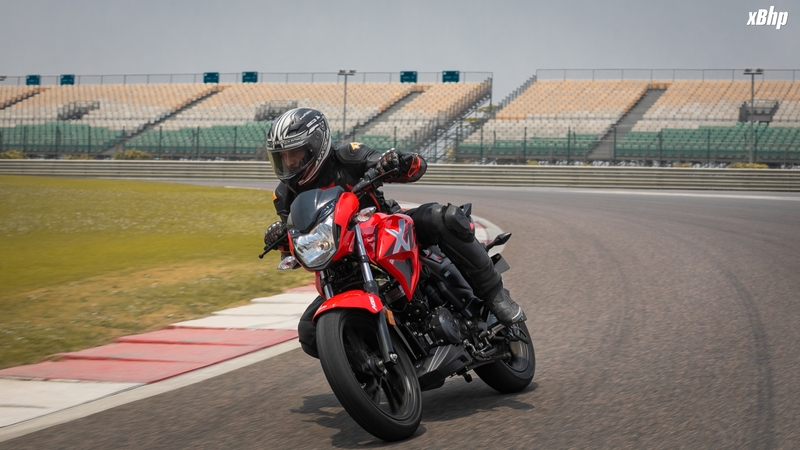 Undoubtedly the best thing about the Hero Xtreme 200R is the way it rides. The engine feels is refined and stress free even in the higher rev range. 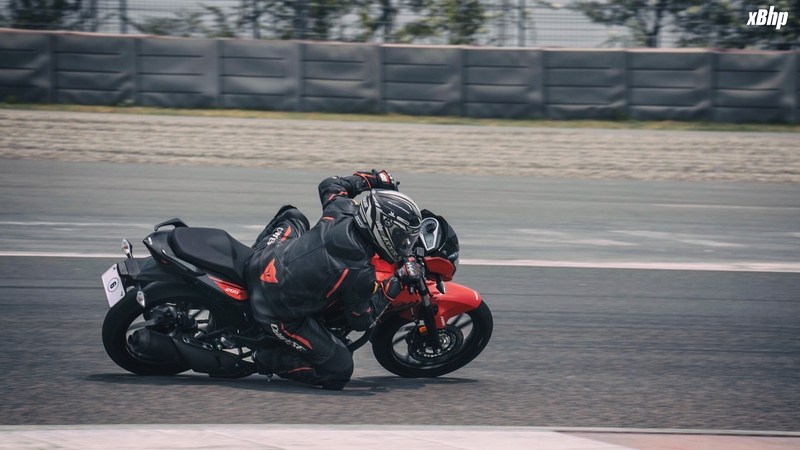 The gearbox feels slick and the bike lunges ahead nonchalantly with the twist of the throttle. There’s plenty of low and mid-range torque that should keep the city commuters happy. I rode it on the short loop of BIC (excluding the main straight, T1, T2, T3, back straight, & T4) and it was a ride I’ll remember for a very long time. The throttle variations did most of the work and seldom did I need to downshift to negotiate the corners. 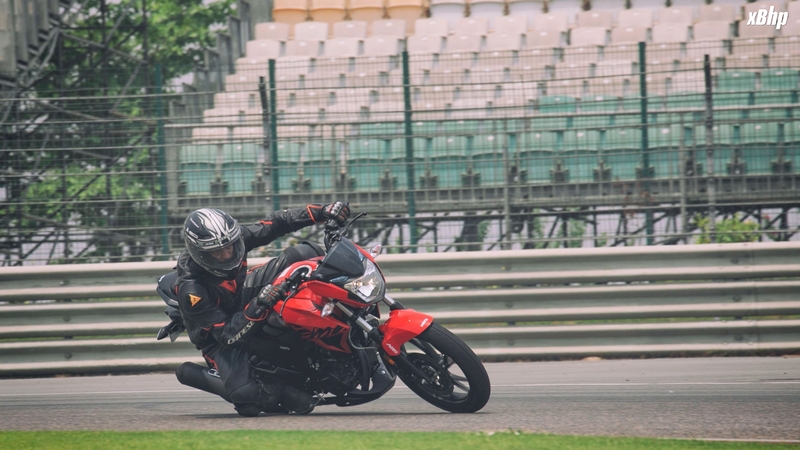 The suspension-chassis was a bit on the softer side, obviously to provide more comfort during day to day rides, but it never come in the way of us having some unadulterated fun on the curves of BIC. 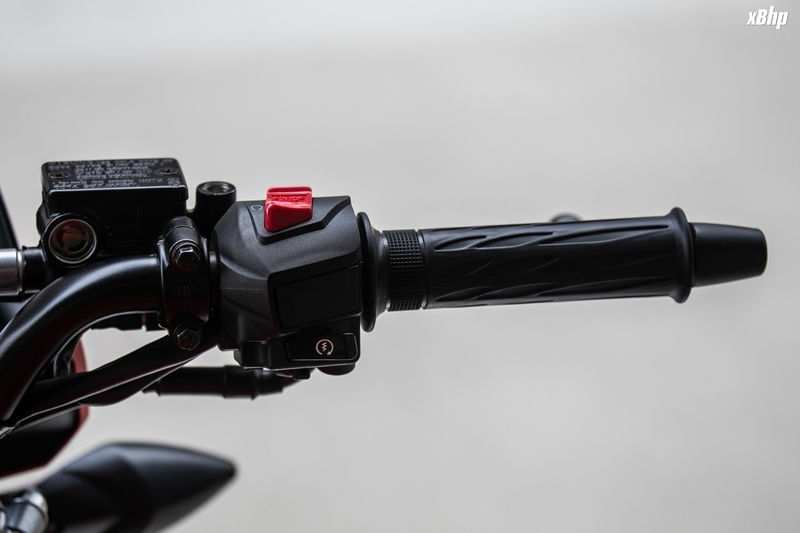 The bike would dip into the corners with ease and would stay on course without drama. The low ground clearance played spoilsport and the footpegs kept kissing the ground every now and then to unsettle the bike on the corners. But, the grip from the MRF tyres was confidence inspiring and knee scraping became a regular affair during the dozen odd laps I did on that short loop. 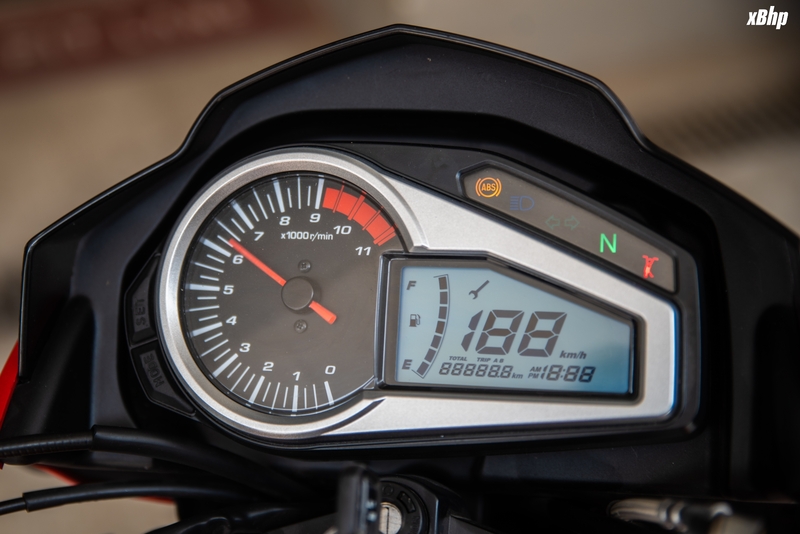 There were no long straights on this short loop and it was hard to judge the true top speed of this bike, but I did notice numbers in the upper 100s on the speedo quite often, the highest being 111 kmph. 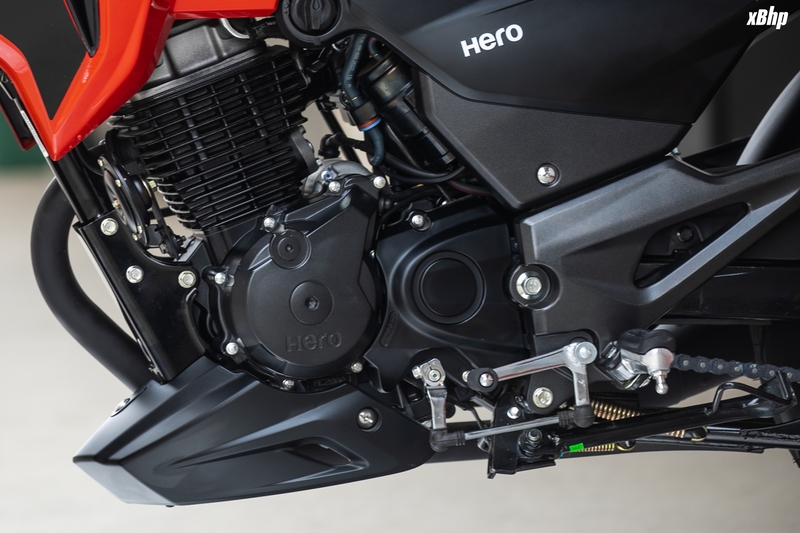 The Hero Xtreme 200R comes out to be a very gentlemanly kind of motorcycle that can be a lot more fun than what is visible on the surface. But admittedly it is not a bike that would make you the talk of the town instantly or make people go weak in their knees when they see it. 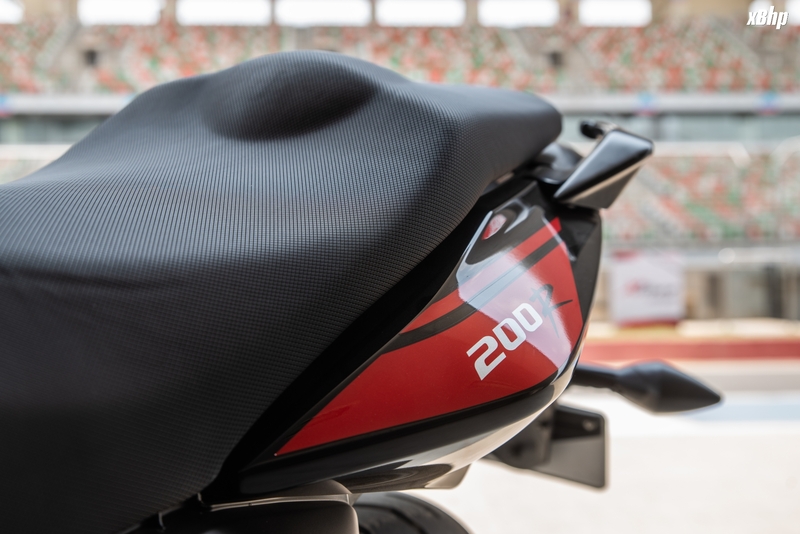 If you are looking for a motorcycle that merges into the crowd yet is capable of giving an outstanding performance when it comes to day to day riding, then you should definitely take a test ride of the Hero Xtreme 200R before making a final decision. It should prove to be a very capable power commuter. 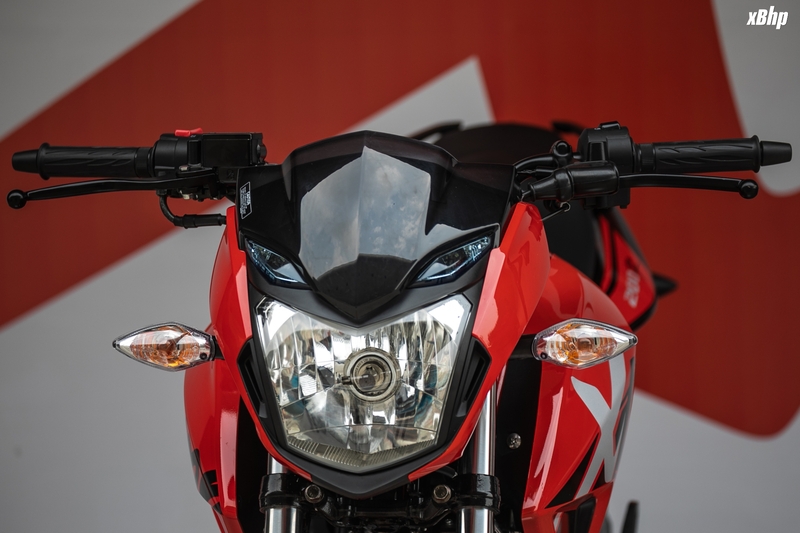 But, it would also face stiff competition from the competitors, from the likes of Pulsar 200NS, Yamaha FZ25, Apache RTR 200 4V, and even the Apache RTR 160 4V as well. Full marks to Hero engineers for not trying to go into heroics (pun unintended) and putting more stress on the practical aspect of motorcycling. It is a very good product in this category from Hero (after a very long time) and what can make or break things for them is how they price it. The price of this bike has not been disclosed yet and we would be keeping a keen eye on how it is priced. 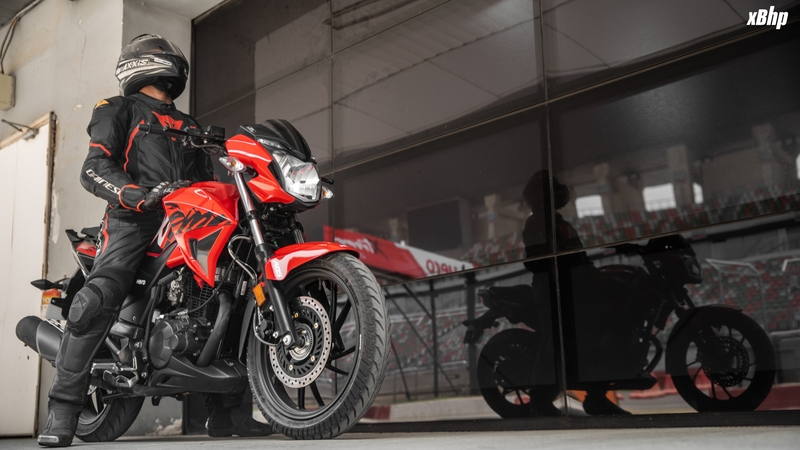 A price tag south of or near INR 90,000 mark would make it a very sweet deal and would compel the prospective buyers to give Hero Xtreme 200R a long and serious look. Samarth 619, NitinGirish, ashwanth.r and 5 others like this. I know most people aren't too excited. I wasn't too excited anyways. 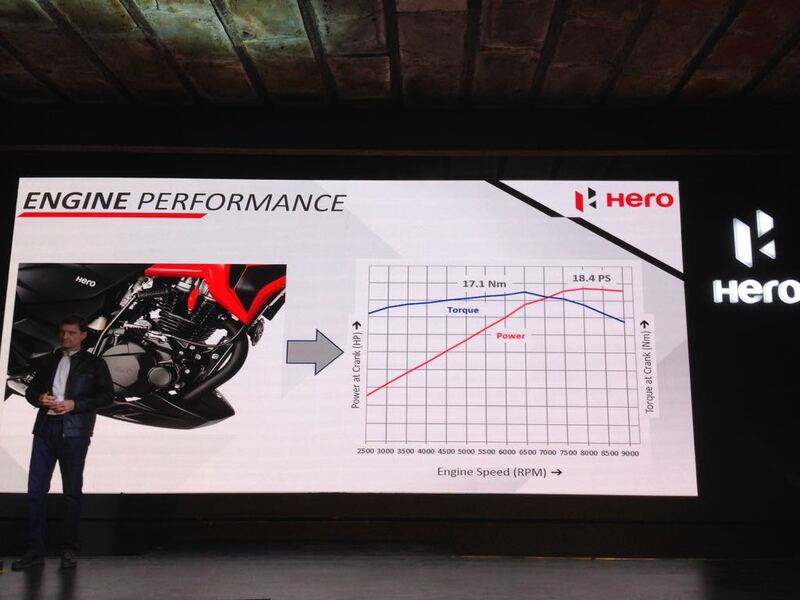 Initially, Hero gave a rough looking torque graph (without numbers), which showed it as a potent performer, specially at the low end to mid range torque. Later we saw a better version, the one posted above. We're looking at above 14NM, at 2500 rpm. Good for commuters, right? So, it turns out to be a well made engine, with a good torque curve. 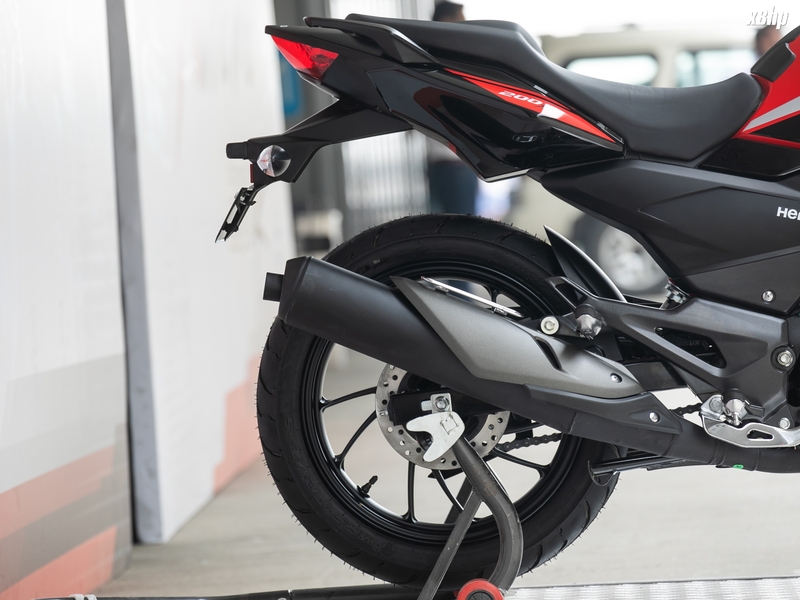 All this coming at the price of a typical 160-180cc, and we know we should not ignore this one.. My question is, if most of us spend 70% of the time commuting, why not focus on better commuting? Of course, I'm not getting one for myself. But anyone who's considering a 160-180cc, in the same price range, why not go for this bike instead? With around 18 PS, you would not be missing that 160-180cc you were planning to get, instead of this. rreneav1987, ashwanth.r, The Great and 2 others like this. Inspite of all the hate comments I see on youtube, it seems to be a nice bike to me. HMC have used quality components everywhere like Mitsuba starter motor, Kehin carb, Nissin brakes and finish is top notch. Sure it cant compete with 200 4v or even some 180s but will be a fuss free bike like other Heros. They say the engine now has a balancer shaft - some international versions of CBF150/CG150 have this while HMSI removed that for Unicorn 150. Waiting for detailed XBhp review. How is the refinement? Any idea on launch date? The bike seems to have the best of all best heros - Achiever (engine), CBZ (styling) and ZMA/ZMR (front disc and ?). The clutch looks huge. Perfect tourer from HMC, IMHO. Hope they launch it soon and it sells in good numbers. Last edited by ashwanth.r; 06-02-2018 at 01:59 AM. manimaaran and adityagaur51 like this. Sure about that? Cause the carburetor from the looks of it seems to be from Mikuni/UCAL. 2015 - Bajaj Pulsar 220F (Currently 31k) < Garage Queen! 2017 - Bajaj CT100B (Currently 21k) < 'Golden Quadrilateral' Runner! The Ride was Good, but Life is short, spend it Wisely! How good is the handling? Mine was a guess, Ashwin. Keihin -> Long, slender and boxy. Mikuni/UCAL-Mikuni/UCAL -> short, stubby and round-ish. Hero/Honda used Keihin for Achiever (and its cousins) and ZMA - so I guess they will play safe and stick to that unless Mikuni offers a very good cost advantage. I have a 2015 Hunk, tank slapped & slided off from slush near a Chennai Corporation trash bin on 1st March & broke my collarbone into three pieces, fully recovered now; I have fallen three times in these three years with this bike & all could have been prevented with ABS. I am very happy with Hero's Nandhanam dealer & Alwarpet service center. My dad still rides a CD100SS & its in pristine condition, so I am biased towards Hero. On the on look for ABS motorbike, I have Apache 200 4V Race Edition 2.0 & now this Xtreme 200R in my mind & I am torn between the two. On one hand I get slipper clutch & dual ABS with TVS but I should get accustomed to a new service center. On the other hand, I'm only having single channel, no RLP & slipper clutch. 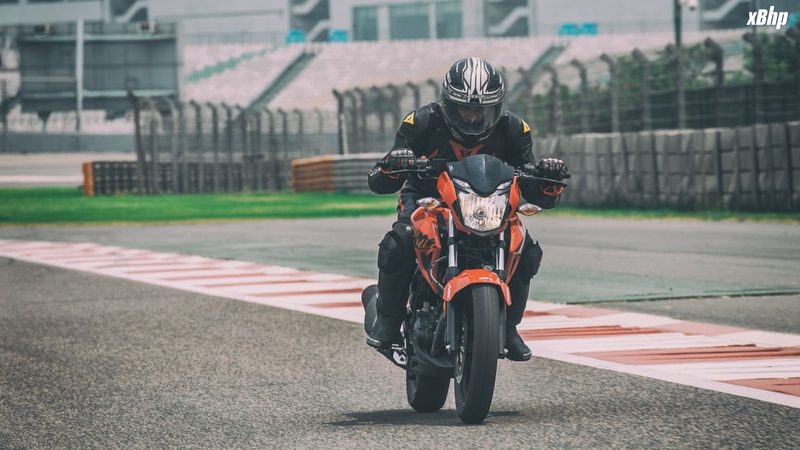 Xtreme has bigger tyres upfront with ABS so that might help in braking than the front break on Apache, I only use 25-30% rear, so I don't care much about that except in rainy or slippery surfaces; then again, I've fallen on such conditions only. I have a consultation on Monday morning & if my ortho gives an ok to be able to ride (I personally feel fine & fit to get back), I'm gonna test ride Apache & the 200R ASAP. Anyone else wondering between 200R & 2004V? Thoughts? 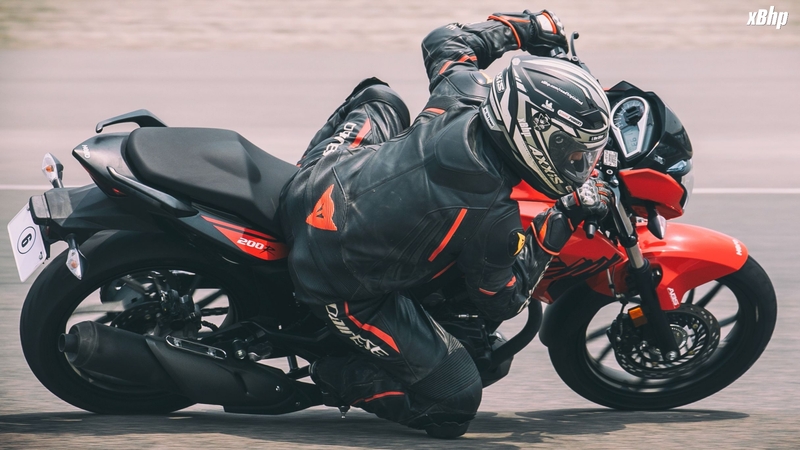 Welcome to Xbhp and hope you get cleared by your ortho soon. ABS is more important than slipper clutch even if it is single channel with no RLP. Even with ABS, you have to master the braking and drive a bit slow in poor conditions. The system is more like a voltage regulator than a fuse. I will pick 2004V for you if sitting position is okay. 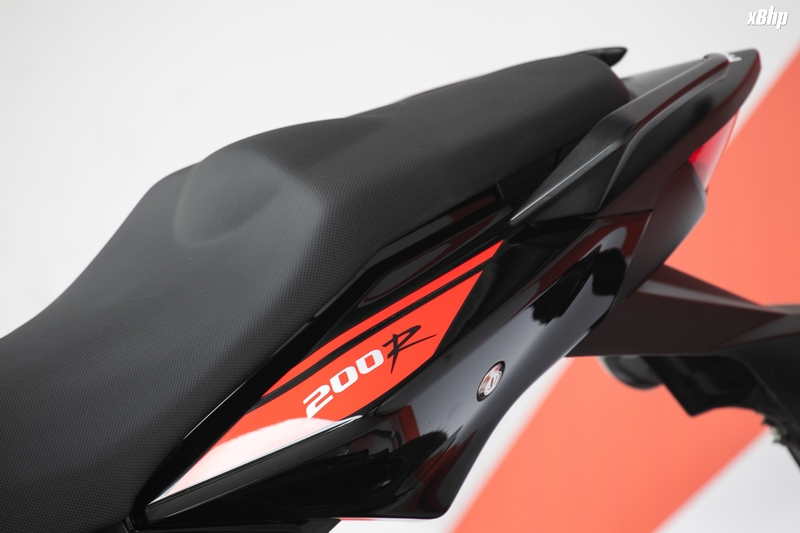 Also, TD the Xtreme 200 R when launched. For some attraction is to butter smooth engines while others like a refined but throaty engine with grunt. Both the bikes look big, chunky, solid and built like a truck. 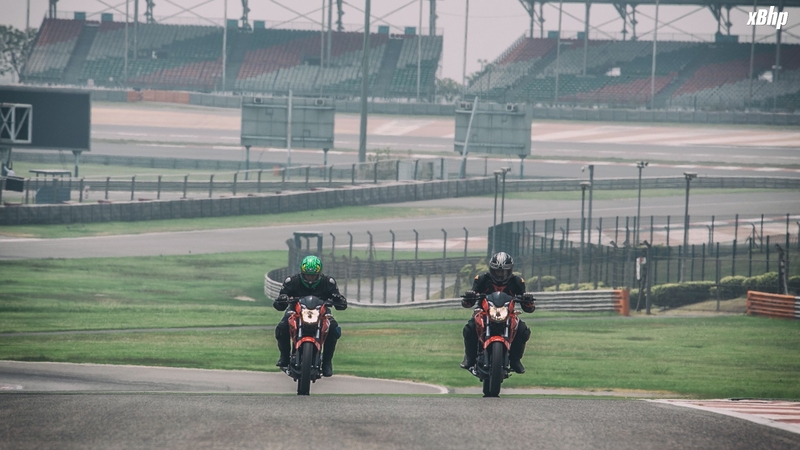 As Samarth said, X200R will make a good commuter. Interestingly, Hero showcased "Hero Hunk 200R" in some other countries - it comes with graphics of Hunk and Fi ! 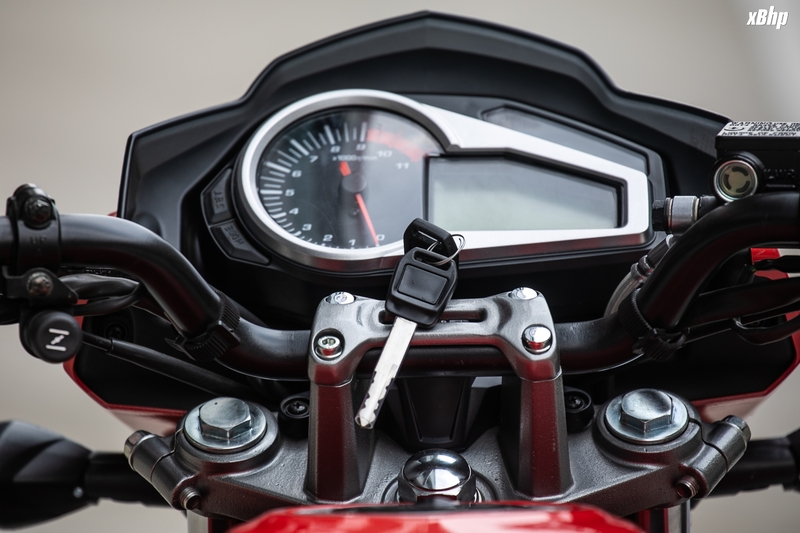 Don't make the decision in a hurry - see how the market responds to the bike and decide. Last edited by ashwanth.r; 06-03-2018 at 07:38 PM. Thank you, it's good to be here; long time stalker and first time poster. Any idea on the grip levels of Remora's? I presume it to be less of the MRF's that is coming with 200R. But like you said, I will hold on until the month end to see the widespread reviews shortly after launch and will decide. Test rides will decide. And yeah, saw that Hunk Fi pics way back! But IMHO Hunk will not do better in India now, its better not to bring it here. Don't get me wrong, I own a Hunk and its a great bike, I'd go as far as to say its the best 150CC out there; but it never moved in any worthwhile numbers from the begining. With the initial good press 200R is getting, its wise to catch hold of it & make use. We have several posts on 2004V, so in case I end up with 200R, I will try and post my thoughts on it ASAP; in order to help others. 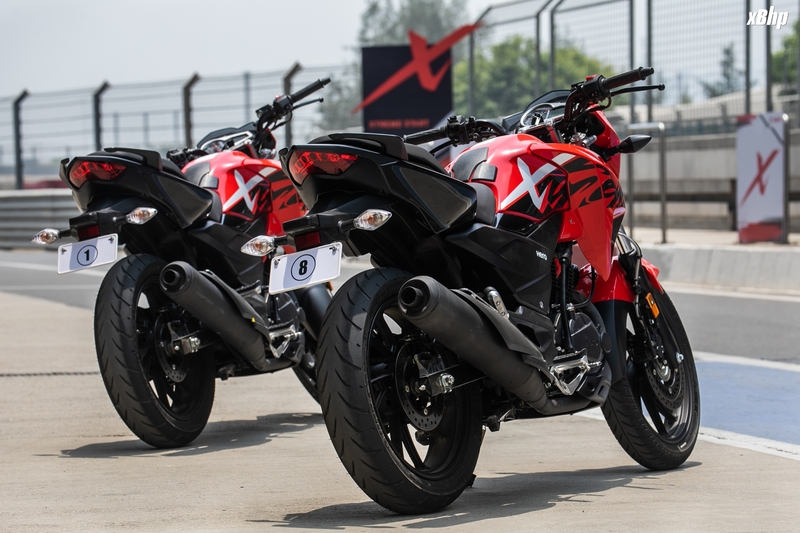 Xtreme 200 can't compete with any 200cc current gen bikes in performance but is sure overall better bike then any 160-180 cc bike in the market. Hero Xtreme Sports Launch soon! By indianhits in forum What Bike?